Do you know how you can use Hindu Undivided Family (HUF) to reduce your overall tax liability? In this article I will give you tips and real life examples on how you can use HUF to save taxes legally. Before that let’s understand what HUF is. The concept of HUF says that apart from individuals there is another separate entity called “Family” which can also have its own assets and liabilities and even regular source of income, which should be taxed separately. If an ancestral residential property is rented out, then the rent arising would be considered as Family’s income and not as income of individual. In real life this rent is shown as income of one individual and he pays the tax on it, however a HUF can be formed and the rent can be shown as the whole family income (HUF) and it can be taxed separately. Until a few years, many Indians used to keep multiple PAN cards and used to show Income under different PAN cards and used these tricks to avail the benefit of slab rates by showing themselves as different persons. This however is illegal by law and is a punishable offence as one person cannot have more than 1 PAN Card. But, one legal way of obtaining an extra PAN Card is to form an HUF. As the Income of an HUF is taxable in the hands of HUF and not in the hands of any Individuals, a separate PAN Card is issued for an HUF and the benefit of income tax slab rates can be availed on this PAN Card. A false impression amongst people is that HUF needs to be created whereas the truth is that an HUF comes automatically into existence at the time of marriage of an Individual and no formal action needs to be taken for the same. However, in case a person who wants to specifically register for creating an HUF, he can furnish a creation deed on a stamp paper (The Format of Creation Deed can be downloaded from here). As HUF is governed by the Hindu Law and not by the Income Tax Act, individuals belonging to other religions are not allowed to form HUF except Jain’s and Sikhs who can create HUF even though they are not governed by the Hindu Law. Two entities are extremely important for you to know in HUF are the coparceners and members. Coparcener is someone who has the right to demand the share of the property of family; coparceners are generally the Karta (Main decision maker of family, usually the Father, but Manmohan Singh had 5 years ago brought an amendment which stated that Females can become Karta & there can be an all female HUF as well), then sons & daughters, grandsons and great grandsons in order of their first right. Wife of the Karta is not a coparcener or even spouse are not coparceners and hence can’t demand/ ask for any share in HUF, they are just merely members of HUF. As discussed above, the main advantage of an HUF derives from the fact that an extra PAN Card is issued for the HUF. We’ll explain this tax saving benefit with the help of following example. Now the Question is – In whose hands should this Rental Income of Rs. 6 Lakhs p.a. be taxed? In real life, the most sought after solution is to show the rent as income of wife or anyone who has no income or less income so that the tax liability is least. But is it the best solution? Let’s see 3 different cases here in which this additional rental income can be shown and how tax can be saved! Option 1 – If this Rental Income is shown in the hands of the Husband. As this Income is arising to the family as a whole, the Govt has also extended this option of taxing this Income in the hands of the whole Family. Although very few people in India know this fact family income can also be taxed in the hands of the whole family by forming an HUF. The above 3 options clearly indicate that Option 3 is the best option as the least tax would be payable by the family if the Rental Income is taxed in the hands of the HUF. These are the steps to create capital of a HUF. First one should open a bank account with the name of Hindu undivided family like “AJAY HUF” with a stamp, ID Proof and the proof of the members of the family of HUF. Important :- While opening a Bank Account in the name of HUF – Banks always ask for a rectangular stamp which states the name of the HUF and also the Karta who is signing it. A round stamp is not accepted as per RBI Circular. The same applies at the time of opening of bank account of Sole Proprietor as well. Next is to apply for PAN (Permanent Account Number) of the income tax. Now transfer money by gifts etc to HUF capital keeping in view the clubbing provisions and tax on gifts under Income tax act, Remember there is no Tax on gifts in kind though they may attract clubbing provisions in some cases. One way of saving tax is by transferring the money received from strangers or family are taken as gifts in name of HUF. So if Ajay starts his HUF called “Ajay HUF” and he is getting some gifts from his father, friends or anyone else, he can ask them to give it to “Ajay HUF” and not Ajay itself. That way the gift will be treated as income/asset of HUF and taxed separately. One important point here, if some stranger is giving gift to HUF, there is a limit of Rs.50,000 on which no tax has to be paid, but actually it can go up to Rs 1.8 lacs as the taxable limit is that much, and if one also has to do investments of 1.2 lacs (total 80c limit), then one can afford to receive up to Rs.3 lacs of gifts in a financial year and there will be no tax liability at all. If family is going to receive an ancestral property or any wealth, then it’s better to transfer it on HUF name so that whatever earnings happen in future in form of rental income or capital appreciation of assets becomes income of HUF itself and taxed in its own hands. That way the total tax liability of family can be minimized. As HUF enjoys separate tax benefit under sec 80C, one can use the income of HUF for buying Life & health insurance for family and the permissible deductions can be availed for tax purpose in hands of HUF, so if the total premiums for insurance requirement of family is Rs.50,000 per year, then It can go from HUF income and also the individual can exhaust his 1 lac limit separately via PPF, ELSS and other tax instruments. Also family day to day expenses can be used from HUF income and hence it will leave other members with more disposable income which one can use to service higher EMI’s if required. For creating the HUF one need to get married, there is no need to have child or children for creating the HUF. An HUF can recieve any amount in gift from bigger HUF’s (HUF of Father, HUF of Grandfather) or any gifts received by the members of HUF (birthday, marriage, etc.) can be treated as assets of HUF , but stranger can gift HUF, not more than 50000 rupees. HUF can pay remuneration to the KARTA of family for the interest and expenditure to run the family business. While all the above points excites people on opening a HUF account immediately and start taking tax benefit, there are some caveats and one has to be little careful. Remember that HUF is a separate entity and represents the whole Family. So once some assets is assigned to HUF, then it becomes part of HUF only and one can be suddenly take money from HUF for personal purpose . If other co-parceners of HUF demand the partition of HUF only then one can get his/her share of the HUF. Otherwise it will not break. Also for taxation point, a lot of people mislead the tax department buy using fake HUF transactions and therefore, HUF is looked with high degree of scepticism. If the HUF is not formed properly and if the assets are income are fudged for evading tax, it can get you in trouble, therefore it’s highly advisable to hire a good CA and create your HUF in the best possible manner with right advice. There is no harm in paying 10,000-12,000 to a CA if HUF can give you 5-10 times tax savings. It would be a great investment, not an expense! Though HUF is very useful tool but one has to use it very judiciously and thoughtfully. Don’t look for tax benefits only , but practical problems also. Be aware that you cannot make a will out of HUF property. Once transferred to HUF, the assets /property becomes of HUF and you no longer have any individual right on it. “A”, who has 2 daughters and a son.He long back ago purchased a house in the name of HUF and put that house on rent, so that the Rental income comes to HUF and will not be be added in his or his spouses’s income . But now , he ‘s retired and wants that this property should be transferred to his son after his demise. But this is not possible as that property belongs to HUF. He can’t even write a WILL for HUF property and with the huge rise in Real estate prices, none of daughter is ready to leave her share in it. HUF will be extremely efficient for those people who have a higher income and high saving rate and some form of ancestral assets which can be marked as “Family Assets”. Evaluate if HUF can really give you that kind of tax advantage or not for people who do not have high salary or who do not have a big enough family. So make sure you can get the maximum out of the HUF and understand the limitations of opening HUF before you go for it. 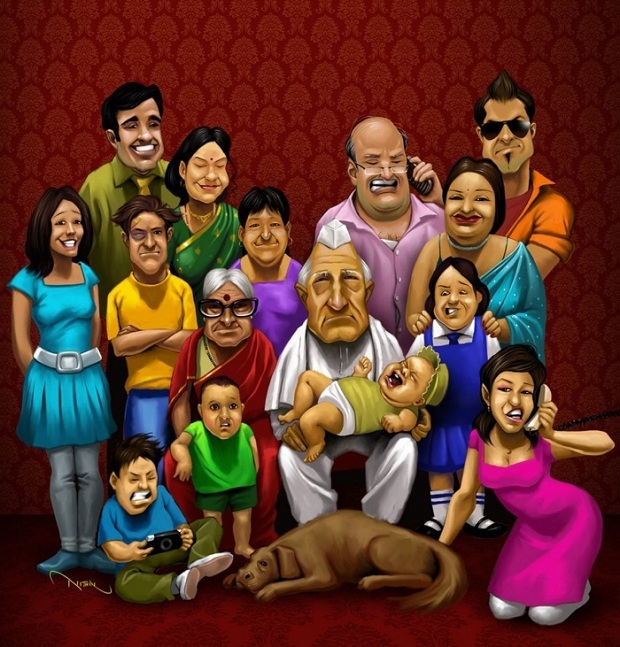 Can you share how was the article and did it help you in understanding Hindu undivided Family? Are you going to open a HUF account? Can government employee creates huf and starts business ? I want to know “How should I go about forming a company on HUF basis”? What are the things to be done? I have a plan to start a trading company dealing with products for domestic and international markets. I want to know to set up an organization in India which can get funds internally as well as internationally. How much time does it take to start functioning for such a company? and the expenses for the same. You can go in for legal advise regarding it. I am salaried and have the following scenario. Let us assume I take out 5 lakhs from my salary income and transfer that to my HUF account, and create a 5 Lakh Fixed Deposit. Now if we assume that this 5 lakh FD fetches me an annual interest of say 20,000/-. Now, will my tax liability be calculated on 20,000/- or 5,20,000/-. Because if it is 20,000/- then there is a point for me to open an FD from HUF. But if it is 5,20,000/- then there is no point because I am already paying a tax on that 5 Lakh as TDS from Salary. Very well written article! I had a query though… I’m a salaried person employed by a firm. However, I do take part time lectures at a college and wanted to know if I can claim tax benefit of this income under HUF? My father had an individual PPF account. I was the nominee of the PPF account. He expired and since I was the nominee, I got the amount credited to my individual bank account. I want to make multiple fixed deposits. Please let me know if I can make these deposits under HUF PAN or my individual PAN. As a life insurance premium for my Mom doesn’t under IT exemption, if I form HUF and shall I pay towards her premium. However i have a small scenario to clarify. 2. My elder Brother has bought a House here in mumbai on his own and has rented that and lives in a rented small house himself. 3. My wife and I have also bought a house in navi mumbai now. 4. So overall we have Rent Flowing in from 3 houses and 2 new houses bought on loan from banks. 5. My wife and I earn approx 4 lacs each anually from our salaries and pay taxes as per slabs. 6. Can My Elder Brother (who is actually a Karta of the family) form an HUF and we all (listed below) be members of it, and will it benefit us (brother, my wife n me) in Saving our taxes. Awaiting for ur valued guidance or information. I wont be able to answer that due to limited understanding, Its better to consult a CA on this . so can we show both incomes are of huf,with 7+7=14lacs income of the huf…..and pay tax of this 14 lacs through huf pan card only……. I have made an HUF. I have a pan card and a bank acc . 1) my father wants to gift some money to my HUF. Some tax consultants told me that this will come under clubbing provision. Your articke says otherwise. Please confirm that the rule is still valid. 2) do i need to prepare a gift deed for every gift that i get? Is there a format? Does it have to be on a stamp oaper? And notarized? 3) i stay in mumbai. Could you suggest a good tax consultant pls. I think you should go with the words of tax consultants only. We will not able to comment on this . We have opened new HUF, whose member are myself my husband and my son. We both are salaried pay my individual income tax. I have a bigger chunk of investment into FD. The interest of the FD increases my tax liability . Can i dissolve the FD’s and move that money into the HUF and then create FD’s in the name of HUF to save tax. Also what should be the right procedure to transfer the money into the HUF. We( Me and my wife) sold our apartment last and received funds which was put in bank FD’s. The apartment was bought under our individual pan cards. We got our HUF pan card few days ago and wanted to understand, if we could transfer the FD funds to HUF and then create FD’s in HUF & save on taxes? Were you able to transfer funds from your individual accounts to the HUF? Did you do this using gift to HUF or how exactly you moved your individual assets (the FD money)to HUF. I have a similar situation to handle , hence wanted to understand. How do I apply for a Credit card on my HUF PAN? can me and my wife open and HUF together without adding our sons. If yes can my wife continue this HUF account after my death also? I would like to understand from Life Insurance point of view. What if HUF is in the name of Father and members include his wife and daughter(got married). What if Insurance took in name of Daughter and premium is funded from the HUF Fund and after the death of Father what will be the status of HUF. 1. Will it be dissolved? or Continue. 2. Will the 2nd eldest person being mother be a Karta of the HUF in her Name? 3. Can Being a Female after death of Husband she can continue her HUF like after her death next Karta is her Daughter. As per Manmohan Singh new law only female members can form a HUF. Daughter dont have HUF at her in-laws side and she wants to continue with HUF in her name after the death of her mother (2nd eldest member after her father death). B) If insurance is given on life of member of HUF (Wife & Daughter) funding is being done from HUF fund and as long as father is alive premium would be funded from HUF Fund after his death will the funding would discontinue? Me and my wife both are working, and we dont have any extra income from ancestral property etc. Will it help to open an HUF account, So far looks like HUF is good only if we have extra income directly in name of HUF, but in this case me and my wife both has separate income. Please elaborate if there is any benefit of HUF in this case and if so, then what are those specific benefits. 1. If i transfer the income recieved directly in to HUF ac to my/other family member account for various purpose like paying bills, premium,.etc. Whose income will that be considered? 2. I have not informed IT dept. about transfer of HUf ownership except the bank .Is it ok?If not plz tell what to do? 3. Is tax limit for HUF is more then an individual? Also a piece of advice your captcha code is far more difficult for humans forget about machines. 1. Its better if you directly pay the expenses from HUF Account rather than transferring to your personal account. 2. You should inform this to the Tax Dept as well as the Karta will change. 3. The tax benefits for HUF are not more than the tax benefits to individuals. I have a rental income 50% in my wife’s Name & 50% in my name. Can I transfer this rental income to my HUF. If the property is in your name and the Rent is being received in the name of the HUF, this is a clear case of avoidance of tax and provisions of clubbing of income will apply in this case. However, if the property is in the name of the HUF, then provisions of clubbing of income will not apply. Hi, I would like to know is it compulsory to open a HUF account? Is there any other benefit apart from tax savings if I open a HUF account? Based on my salary and bank interest, I pay tax at 30% level. Wife is not serving and only daughter is married. No income from ancestral property. Will it be helpful to create HUF with my wife and daughter? Regards. Can I transfer my monthly salary money to my HUF account and then will it qualify for tax exemption ? How can I benefit from HUF PAN, in case of my wife doesn’t have any income? I am professional employee, but my wife doesn’t have any job. We have 2 girl kids, will I get benefited from In-laws land properties transferred to my HUF account? If, for every question you are referring to CA then what the use of this group ???? This blog purpose is to spread knowledge about the points at basic level. Some queries can be complicated and only a CA has a deeper understanding, hence I say that one should connect with them. I can answer those complicated queries, but I would be mostly wrong, because I have limited understanding in few areas. Manish is a Financial Planner and one of the best financial planners in India. He also has good knowledge of Income Tax. However, for the kind of query asked – you need a CA to answer it. Yes, you will get the benefit. If the properties of your in-laws are transffered in the name of the HUF, the rent arising from the properties would be taxed in the hands of HUF and not in your hands. How huf dispersed? Can daughter remain member after her marriage? Can she claims after marriage from huf wealth? Can huf karts or member utilizes money of huf. Does he had to return that money to huf with or without interest? Daughter will be member after marriage also . She can claim after marriage . Can equity shares in the name of the Karta (on individual basis) be transferred in the name of the HUF? What are its tax implications? I want to open an account in bank on behalf of HUF. Bank authority told me account will be open only current but i want to open it saving account. Is it mandatory to open Current account ? My father (as kartha) is holding HUF PAN card and paying taxes. I am the only son. I am married now and i want to create HUF for me & my wife. Can i do this? Can my father still maintain the HUF? Can i still continue to be a member in my father’s HUF? We are four brothers and one sister. All are married. Entire property acquired by my father is in my mother’s name. Father is no more. My mother wish to transfer her entire property to a HUF wherein all my brothers will be member. Can such a HUF be formed. What will be tax implication ( in any form) on transfer of her property to HUF ? Kindly help. Thanks a ton sir for very prompt and lightening speed response. I would check and get back if I find something on how to do this. In the meanwhile would it be possible for you to share some links etc. where I can read more about this? Me and my wife both are working and salaried persons. Have 1 minor daughter. My question is straight forward. We have recently created an HUF PAN with an objective of tax savings etc. We are looking to purchase a car which is 11 Lakhs value. Would there be any benefit if I purchase it in name of HUF and not in my own name. If yes, how should I do it? Should I first purchase in my wife’s name and then transfer or should I directly purchase in HUF name and even after car is in HUF name, how can it benefit me i.e. should I take it on loan or down payment etc.. etc..
Can you please enlighten benefits from this angle of car purchasing in HUF name? Directly purchase in HUF name. I think you should check with a CA on the details of how to do it and how to avail the benefits ! are the cash withdrawals allowed in HUF? Which means from HUF bank account the Karta has been withdrawn some cash and utilized to meet his expenses. Is it allowed, Kindly explain me. Yes you can do that. Anyways who will stop ? Welcome .. Glad to know that rahul singh .. I am new to HUF world and want to grab as much information i can. My consultant that members of HUF can give gift to HUF not more than 250000 per year. if they gift more than this limit than this is liable for Tax. but when i read on internet it says HUF members can give any amount and it will not be liable for tax. 1. How many HUF a male member can create or be part of? Ex. one could be his parents HUF & other can be made his wife . Is that possible. 2. Say if i gift say Rs. 5000 to HUF account than does that mean that it become tax free for me i.e. i dont have to pay tax on that Rs. 5000 & if yes, than what is the upper cap to same. 2. No tax benefit for giver EVER ! Some others like Srinivas has also cleared many points. 1. who has the power of deciding for full partition and % share of all of us???? 2. what will be the % share???? 3.What maximum share can be transferred to the karta’s individual income if all other coparceners are below the age of 18???? Apart from my salary (30% tax bracket) I earn money from FnO (Derivative). Any way to save tax for income from FnO. I am single, my parents are also in 30% tax bracket individually. I don’t own any shares, trade only FnO on NSE. Won’t you even give a hint?? I would end up paying 30% tax on my income in FnO. i would like to know if Grandfather can pay PPF of Granddaughter from his HUF and claim the same in 80C Deduction ??? Mr. Manish I would like to ask you that Can HUF be a proprietor of coaching class? I mean to say that can HUF run the coaching class as a proprietor by employing the teachers and other staff? The revenue generated, will it be the income of HUF ? I have some queries w.r.t to the above topic. I did some research but still i was not happy with the result. 1. One of the basic criteria of a HUF is that members of it must consist of unmarried daughters. What will happen to her once she gets married? 2. The recent judgement and amendment of Hindu law act 2005, held that married daughters are eligible for share in the ancestral property. Is the judgement given a retrospective or prospective effect? 3. I have a lot of confusions about the differences b/w a coparcener and a member. I failed to understand it despite several efforts. 5. I also came across facts where if the HUF made gifts to the married daughter, the gift amount would be exempt in the hands of the daughter, but the income from such gift would be taxed in the hands of the HUF. I appreciate the patience put in for having my doubts clarified. 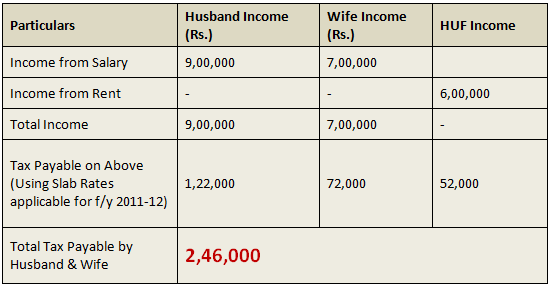 if i and my wife are earning same… assume 7 lac per year, then the whose PPF account will be more tax saver??? mine or my wife’s??? I have no idea what is your question ? can govt employee become a member of HUF, where HUF is doing some business actovities??. Karta of HUF is an employee of Non Govt Org. Other than Karta all are Govt employee. Govt employee can’t engaged in any business activities, wheather forming an HUF business activities can be done. I am not very sure on that ! Hi my salary package is 7.8 per year. and nearly 13000 is deducted for tax from my salary.. and i m not married. so can you suggest me any idea that i can overcome the tax? I dont think you have any escape out of it ! hi, I am working as a labor job contractor with one company under sole proprietorship. If I form HUF, then income from same source can be bifurcated into my personal as well as HUF account. form a HUF deed and open a bank account, tell ypur customers to pay HUF portion of income to that new account. I and my wife with two minor childerns want to farm a HUF , I purchased one Commercial Site and constructed Building, now it is started to earn Rent of Rs.5,00,000/ per Month Can I farm a HUF, and save tax liablility. I and my wife are not working. And is it I will be a kartha, can i Gift my own property to my own HUF ? This article has been quite old now .. I am not sure of the current rules change . Ques:3. Once HUF is created, how can be disolved? I have a question to ask. Can paying 15000 Rs per month( from my salary) to the HUF account (me & my wife) as monthly domestic expense which my wife needs per month , be treated under income tax act? Can I get income tax benefit on my personal income on account of this payment which is a real case indeed? Hello sir , can I open my huf account as I’m married and father of two kids , and loan some shares to huf so that it can do some trading and at the end of year it will give back me my shares , that way my shares long tearm capital gain won’t get used and income created by huf so text liabilities also will remain with it only . Just one query: Lets say A(karta), B(wife) are part of a HUF. Can B give the gift to HUF? If yes, lets say B gives 100,000 to HUF and HUF invest that money in FD. Will the interest earned be clubbed to the income of B? If you do not have a family, then I dont think HUF exists anyways . No he cant, its not opened like this, it automatically exists the moment he was married . please help me to know is nomination allowed in mutual funds for the investment made under the HUF status . Nominations are always allowed in mutual funds .. I want to open HUF a/c.Mainly because my son in US has a house here,which is rented.The rent is being credited to SB joint a/c with my son and my wife. Now tenant is asking for giving the PAN card number. Can i give my wife’s PAN number or my son(NRI) PAN number. My friend suggested to open HUF a/c and HUF PAN card and give this HUF PAN number to the tenant. Please advise. Your article on this subject is excellent and made me think twice/thrice whether to apply for HUF PAN card or not. However, HUF can take loan from a relative at a reasonable rate and invest the same, for its advantage. Another point to be noted while routing funds to HUF. HUF can recieve only upto Rs 50000 per year without any onsideration. If the inflow is in exess, tax incidence will happen. One way to mange this is tak loan from relatives and pay nominal interest. For example, I can take a loan from my mother, then pay back 8% per year which she normally gets in any FD. I inturn can invest for better returns amd the balance can be inom of HUF. Thanks for sharing that, I think that 50k limit is the gift tax limit ! My parents are quite old & brought them to hongkong resently where i live.My father has a huf property in his name & i am the only son.He want to gift this property to me,because he does no want me to face all the problems in india after he dies as I do not know about taxes in India. Can you pls advice me about this matter . Whats the advice you need in this case, its straight forward now . Just visit back India and ask your father to transfer things on your name (I mean HUF should transfer, your father will take actions as KARTA) . Thats all .. If this is not done right now, then later you will have to execute a WILL or things will happen as per Hindu succession act . Given that HUF is involved here, I suggest that better complete things right now to avoid running around later! Many Thanks for nice article and useful information. I have a few questions. 1. I have a joint flat with my wife which I want to sell. Can I create a HUF (me & my wife) and transfer the Capital gain amount to HUF to minimize the taxes? 2. Will the creation of HUF make the joint property part of HUF (as HUF members will be me and my wife)? 3. If the HUF account is not transacted for long time, is that a problem? Any inactivity threshold by banks? 4. Can I continue to put our LIC, health insurances under HUF. I think yes. I forgot to mention that my wife is not working. I am an NRI and had contacted Central Bank of India reg opening of HUF account but the Manager declined to open the account saying “According to our Bank’s practice HUF accounts are not opened for NRI. Please be guided accordingly”. Please note that I am the Karta and including me all members of HUF are NON-RESIDENTS. Is it possible for someone to pls provide the RBI circular or any such govt notice so that I can again go the branch with this info. I tried searching for this on RBI website myself but could not get it. I hope someone could help me with relevant info. I guess you already asked this on forum ? Hi Manish, I have asked this in the forum but so far unfortunately no responses. You mean you asked on http://www.jagoinvestor.com/forum ? I have asked a CA friend to answer on this . I am ignorant on that ! I am a divorcee with a child. Would like to understand whether I can create an HUF. I am a salaried person along with service I plan following. shall I purchase my machines on the name of an HUF – as a properitor firm and start a small business ????? My father has FD for around 5 lacks. He has expired. Now can I trasfer those FD into my HUF. Dear Pavan, yes is the answer. Only if you can prove to be the sole legal heir . very clear interpretation of HUF. Views from all angles have been brought out. Wish you write many articles on taxation. I am US citizen, Patel by cast, my father is on Death bed. I do not have HUF at present. Can my father give his property in favour of my HUF? Do I have to offer tax on income generated from such property to US tax authorities? What about 1st half of the question? Can my father provide in will to transfer his assets in his absence to my HUF (which not existing at present and I wish to create the same by will only)? I am married Hindu having citizenship of USA. Dear Darshit, as you are married, your HUF is already in place. Regarding the taxation of USA on the father’s property transferred to HUF, please check with US Tax professionals. Great article and a wealth of information from the comments below as well. Can you please answer one question: I have a vehicle in my name, which I would like to transfer to my HUF. This vehicle would be used for commercial purposes and the income earned would go to the HUF. Is such a transaction allowed and for the transfer to take place, what documents would be required? Would a gift deed describing the details of the vehicle sufficient; or do I need to get the vehicle transferred from the RTO in the name of the HUF with a change in the Blue Book / Registration Cert. as well? An answer would be extremely helpful. Dear Ajeeo o Gareeb, if you are transferring the vehicle with out any price consideration from HUF to you, it ‘ll not be accepted by Income Tax people. So better to sell your vehicle officially to HUF & then only earn income from this vehicle. Me and my wife are salaried. My wife has a shop on her name ( taken from my mothers selling of land – after she died ) and we also have another shop on my name and her name. Can we transfer both these shops to HUF ? If we can transfer , then how does one do it ? The shops agreement papers are still on diff names . Do we have to re – register it ? Or do we have to sell it to HUF by creating a NEW agreement ? Can I as Karta of A HUF withdraw money from HUF account for the purpose to meet with any other members personal expanses / education / marriage ? You can do that .. If the member is the part of HUF , it can be shows as a regular expense , but not sure if you will get any benefit on tax front .. Please confirm who will receive the Tax benefit for the same. Dear dhaval, in your query, are you talking about your own HUF or your father’s HUF which is going to invest money in to Mother’s PPF account? the answer ‘ll be different for each case of HUF. My wife who is a coparcener in my HUF .Is it possible for her to become a Karta for her ancestoral properties? Dear Arun, what’s the current status of your wife’s maternal HUF? is there any Male member in it or not? Sir, I stays in my own flat in Delhi. A per my company norms I have signed a self lease with my company and getting a rent from my company. As a result I pay double tax on Rented income i.e. 1st as perquisite and 2nd 30% on total rent as owner. Can HUF help in saving tax? do I need to re-sign a self lease between HUF and my company? Can i open new PPF account in name, this year and deposit money? I was given to understand that money cannot be deposited in PPF account after 15years, is it true? since the discussion was about PPf account – What i meant was, whether i can create new HUF with my wife or myself as karta, and then open a new PPF account? I don’t have old PPf account. means self can give to self karta for new huf file. We are not talking about clubbing provisions here .. its the question of whther the tax is paying on the amount recieved as gift ! Dear sir, Thanks for your article. Can HUF do business in the another name? What do you mean by another name ? Does it makes sense for a married couple to form a HUF if both of them are in 30% tax bracket but don’t have any ancestral asset ? Depends on your complexity . Meet a CA and he will show you how it will help you or not help you . Just because one is married, they should not get into HUF ! The family members who are not included/declared (such as married daughters and not part of the family) in the form while opening the HUF account will also be considered as members/coparceners?? Not sure on that .. I am planning to open a ice cream parlour on my father’s name. he is retired & comes in 20% slab. We wan’t to open an HUF on his name. We have applied for HUF pan card. Now for registration of HUF, does he need any gift cheque from his father or big brother to be shown as gift amount? If yes, then is there any alternative for that. Manish, great article. I have a question. I have a house. I would like to rent it out. But i don’t want to pay enormous amount of tax on that. So I was going through the various ways of tax planning to save tax on rental income. I was thinking of either creating a HUF or forming a Company. There are lots of issue in opening a HUF, what, if later on,one party asks for his or her share. I want to avoid all these issues. So, is it better to go for formation of company and plan accordingly? Can I form a HUF with the self acquired house (asset) with my wife and married son? What will be rental income look like? Will be as my income, being Karta – or, will be of HUF’s? To my understanding, with the inputs from this informative forum – it will be HUF’s income and to be seperately filed. Question remains – how the expense of household can be accounted for? I wanted to ask whether HUF can give cheque in the name of person from whom Karta is getting his business items i.e. Karta’s creditor. They do not allow what ? The sale ! First of all thanks for the info. I have some doubts. My father opened HUF bank account just for the sake of income tax purposes. He has earned money and tranfered to HUF. Later on he purchased some property from the HUF account. Here I would like to mention that there is no ancestral contribution to his income except that he got a little land from his forefathers. Now the Q is will that property becomes HUF even though he self-acquired it and who inherits the property? i. What would be date of incorporation? Can I put it as 01-01-0001 if I am unsure about it? ii. After getting PAN card and opening a bank account, Can I put around 6 Lakhs cash in the account (assuming 1.5 lakhs tax-free slab amount for 4 years) for 2009-10 to 2012-13? Source of income is agricultural income from 25 acres of land. iii. If I have paid an LIC term loan policy of Rs 112000 p.a. for last two years from my individual account and have not claimed it under 80C, can I add another 224000 Rs to the account? Manish, i am working as a Home loan credit manager in MNC Company. Please tell me about annexure 5 and please send me the Annexure 5 format to me … i am very great ful if i get today …. If I have an HUF account at a bank and wish to deposit cheques/income recieved in my personal name as Karta or that of my coparceners in my HUF account, can my bank refuse this? If yes is it because its a totally different entity from me and my family members? Any RBI clarification on this available? As far as I know , in this recent budget, HUF members can contribute money from their side in HUF . I stared helping my father helping financially at the age of 13 years by milking and selling milk, at the age of 16 joined Indian Army as a boys Apprentice in 1979, I stated giving money to my parents and did not open my self -bank account to keep my earning separate. I left the Army in 1991 and handed over Rs. 86000/- to my parents this includes the commutation of my pension for 15 years. We are 5 siblings 3 brothers and 2 sisters. I am the eldest among brothers. I married at the last in the family. My younger brothers are well settled and are happily married. During time my youngest brother and his working wife has purchased their own flat in Delhi. At he partisan and distributing the property the whole property worth were 30 lacs. This does not includes the worth of the property they have purchased on their own name. In our family we were having 2 flats and some agriculture land. And the total value was 30 lacs.In 1999, my father divided the share my brothers got a flat each and I was to give 10 lacs but my father deducted 3 lacs from my share. Out of which 2 lacs my youngest utilized to pay for the instalment of the flat they have purchased. And 1 lac was utilized by my younger brother. On being not satisfied i left the home along with my wife and one son in Jul,2000. In Sep, 2001, my father gave me a cheque of 4lacs and 95thousands . This is the only share I got from my father. When I asked my parents abut my share in the flat my youngest brother has purchased living in a joint family, my parents says he has earned the flat from his own earned money, and I had no right to claim on it. When I told them that I have also handed over Rs. 86000/- to you at the time of my retirement from the Army, if I would have also purchased the flat from this money, and now the the coast of that flat could have been 80 lacs now. In between my respected father expired in the last May, 2012. He had not written any WILL. Is there any law as to how i can claim my share from the flat from my younger brother. Sorry to say but law does not have any place for emotions and good ness you did . As your brother has bought the flat on his own funds and your father divided things in start itself (and by now I am sure the flat must be on his name) , I dont think legally you stand any chance of getting anything . I must say you must have thought about yourself more than others at some point of time. A very basic question….In case there is no ancestral property then how HUF can earn income? Can I (being Karta) transfer a certain amount in HUF a/c and that can be considered as a income of HUF? Perfect and Thanks…..But am I right in concluding that if I transfer 100,000/- per year to HUF a/c…..that will be considered as an asset for HUF and HUF has to pay tax (according to limits) for whatever earnings made on that asset/investment??? And let me tell you Sir, that you ROCK. Even after googling so much time, Your article was the only one which gave me maximum clarity on HUF!!! Welcome , spread the knowledge ! Sir….the question remains……am I right in concluding that if I transfer 100,000/- per year to HUF a/c…..that will be considered as an asset for HUF and HUF has to pay tax (according to limits) for whatever earnings made on that asset/investment??? From your above article i have some quary..
Q1. is ther any direct gift tax on above amount? Q2. now finally how much tax i want to pay? and if same thing do for the current year? then……. Please tell me can a HUF buy a car in name of the karta from the funds of HUF or it is to be bought in name of HUF only?? A Daughter after marriage continues to be the co-parcener of her Father’s HUF and becomes a member of her Husband’s HUF. So this way, she is the co-parcener of only 1 HUF during her lifetime and not of two as stated in the article. hi, i heard someone say that according to new rules members of huf can contribute towards huf. also please tell me how can i create new huf if my parents donts have a huf. hi, need one clarity..should one open a bank account first or have a PAN card first? You should generally get a PAN card first, but if opening bank account is neccessary, better do it first ! HOW TO APPLY FOR PAN (HUF) AND WHICH DOCUMENTS ARE ATTACH WITH PAN APPLICATION. Is the rental income distributed to all the members , if yes , then you will have to show it as income , But the better thing was to show it as rental income of HUF only, that way you will save on the tax part ! It was a very good article. I have few questions. Please respond. 1. who will be the members.? 2. Can i include both daughters as members? 3. If I want to include either one only as member is it possible? 4. Can I restrict the HUF to only to me and my wife? 5. Can i transfer the house purchased a year back to my newly created HUF and bring the rental income into the HUF? Thank you sir. Your information will be very useful for me. Thanks Manish the informations are very usefull. Still your cmments will help me. I have HUF with my wife and two sons. I purchased an old house in 2004 with my savings. Now i want the old house to be demolished and merge the vacant plot to my HUF. My both sons will bring money equally for new contruction. Is it sufficient if I make an affidevit on stam paper to that effect and notorise or registration is required. should my sons pay the builder directly? If they deposit money in HUF a/c and then money to be paid to Builder will that will taken as income of HUF and taxed in the hand of HUF. The rented income will be taxed in whose hand? Do you want to make this on the name of HUF ? In that case your sons can gift the money to HUF and then the payment can be done on HUF name , then property will be HUF’s and rent too ! 1.What is procedure to tranfer the plot to HUF. 2. The money gifted to HUF will not be taken clubing with income of my sons? 3. Any CA in chennai who can guide me correctly? You should meet a CA now , we are not aware about any CA here ! Thank you for your reply. To apply for Pan card for HUF, is the affidavit required on plain paper or stamp paper and is it required to be notarised? Can you provide me with any sample which can be used to make the affidavit? I found your site and this link very informative. We are an NRI couple who are planning to open an HUF File. We do not have any ancestral property. It would be very much appreciated if you could kindly clear my following queries and doubts. 1. With recent announcement in budget, I understand my husband and myself can contribute to open and inflate the HUF corpus. Is there any limit to the amount we can pump in each year? 2. Will clubbing provision apply in this case? I understand if I transfer say 20 lacs to HUF and invest it say in FD for a year, the interest on this 20 lacs will be taxable in my hands in first year. Thereafter on renewal of FD this income will be taxed in the hands of HUF. Is this correct? 3. Are there any don’t in how HUF funds can be used by the HUF members? 4. I received say Rs. 1 lac and jewellery during my marriage several years ago. Can I show this as HUF asset and how? 5. Will gift received from my parents to our HUF where my husband will be Karta be subjected to the limit of Rs. 50,000? Can this gift be received in cash? 5. Yes it can be recieved in cash . Excellent article. I wanted to understand the HUF since long. 1. If HUF is created. Can Karta start withdrawing the amounts or transfer interest received to his own individual’s account? Can this be challenged? 2. If karta has one daughter(elder) and and one son(younger) both married and having children. Who will become Karta after Karta’s death? and who can ask for partition of the HUF? 1. It cant be transferred just like that , there has to be a reasoning . 2. Son will be the next karta , anyone can ask for partition as both son and daughter are both co-parancer ! 1. How can I show that a particular money is gift? 2. If they invest that money and earn some profit, will that profit income be taxable to me under the provision of clubbing of income? 1. You will have to make a gift deed . My father had an HUF in his name and after his demise i have become the Karta. Now, before my father passed away he wanted me to have an HUF in my own name since i m married and have a kid. I am working and my wife is housewife. 1. I understand that I can gift money to my wife and then she can invest and earn income which will be taxed in her hands? Is it correct? What is the procedure to gift? Anything to be done legally to show something is gifted? 2. If that does not work, can I loan money to my wife and then she can invest and earn income which will be taxed in her hands? Is it correct? What is the procedure to loan? Anything to be done legally to show an amount is given on loan? 3. If I create a HUF with my wife, and I (and not HUF) get some ancestral property from my father, does it becomes property of HUF or of me alone? Can my father give this property to my HUF also? Can I divide our HUF before our children become major, with agreement of wife? If done so, how the distribution of property will be done? Does some part goes to my children also who are minor? Whatever part I get, will it be taxable or income from it taxable in my hand? Hi Karan, This is definitely a very interesting and informative article. Explained very well, kudos to you!! I have a question though regarding the creation of HUF. I had actually been talking with my CA and he told me that HUF can only be created after having a child (as opposed to just after getting married). I am married, but don’t have a child yet – can I create an HUF? I did more research and found out some conflicting reports – for instance I came across an article on TaxGuru http://taxguru.in/income-tax/meaning-formation-taxation-membership-and-partition-of-huf.html. It states that the HUF can be created with two members and just one coparcener, but the income in the hand of the entity would not be taxed in the hands of the HUF but in the hands of the sole coparcener. Thus for the income to be taxed in the hands of the HUF, it needs to have two coparceners. In Dr Prakash B Sultane v CIT ( 148 Taxman 353) the Bombay High Court held that that the property does not lose its character merely because at one point of time there was only one male member or one co-parcener. In this case , the assessee was a doctor by profession assessable in his hands as an individual. The assessee was a member of a bigger Hindu undivided family which was partitioned on January 1, 1972. At the time of partition and right up to January 22, 1980 the assessee was a bachelor. During these years, the income from assets on partition was assessed in his hands as his individual income. When the assessee got married on January 22, 1980, he claimed that the income from assets received on partition is assessable in status of the Hindu undivided family consisting of himself and his wife. Thanks Manish! Thanks for response! If I settle in US and I create HUF post my marriage, How can HUF benefit to me Indivdual once I is settled in US and start paying Taxes in USA ? As an Individual, I will be declaring all the income earned in India and that will be clubbed in my Income earned in US, but how HUF income will be treated ? As on today, property in jointly my name and my mother name and I get rent divided in my Name and my Mom name, can I ask Tenant to issue me Rent Cheque in name of HUF of my share ? Do I need to do anything before I ask tenant to issue rent cheque in the name of HUF ? Can an Individual be Karta of two HUF ? As per Law, Eldest Son get the Karta role post the father death ? Can Eldest Son still maintain his HUF (Self, Wife and Kids) which was opened when father was Karta of his HUF ? I mean to ask, can he maintain HUF Opened by father as Karta as well as Karta of HUF created by self ? My father deceased recently. We have neither a HUF bank account nor a HUF PAN card. We received an anscestral property. Can I apply for a HUF PAN card now with me as Kartha and my younger brother as co-parancer. If HUF was not present , then right now there is no score of using HUF PAN and all .. Why are you looking at HUF angle at all in your case ! I learnt HUF is automatically created on the time of marriage. So my father has technically an HUF. But my father hasn’t used it by creating any HUF account or HUF pan card. Suppose after my father deceased we received some 15 lakhs from ancestral property. Is it now possible to create an HUF account which my father has? So that we can use for tax purpose as my mother along with us has other source of income exceeding minimum tax slabs. I searched in internet and found this information in a site “There is no formal procedure for creation of a HUF as it is automatically created. To form a HUF, the family must have at least two members, of which at least one person is to be male. A HUF can also consist of female members, being the wives and unmarried daughters of the male members. Also As per my understanding the source of HUF need not be only through an HUF. Then how come the first HUF get created. Thanks for taking your valuble time. I am relieved that I can create an HUF in my name instead of my father as I am the eldest member. Who all can be member of HUF ? 2. I understand my DAD can have his HUF, my brother can have his HUF with its family. 3. I got divorced, with Divorcee status, can I still create HUF ? Is HUF account there at all ? If yes , then you can take the rent reciept in name of HUF. I need clarification, I can ask rent of my share inmy HUF i.e. SACHIN (HUF), even if property is in jointly held equally in name of my dad, mom, me and my brother and property not in name of HUF ? Thanks Manish, you are doing excellent stuff to help people understand comples stuff in easy way..
i have ancestral agri land the income of which is shown in my return. Now suppose i form an HUF, can i transfer this land to my HUF ? and show agri income in my HUF return. If it is possible what is the procedure to do the same? Thanks in advance & looking forward for your expert opinion. Thanks a TON!!!! for your valuable time & advice. Looking forward for more informative & handy tips on Tax Planning from u.
Hello, This is very informative. If you are aware of the IT Act / schedule where HUF members are allowed to make a gift to their HUF, please let us know. And to extend this point further, if I am Karta of my HUF and I have some shares in my DMAT account, can I gift these shares to my HUF? Will the Depository allow me to transfer the shares to HUF? And will there be any tax liability on me or HUF? (i) I am having 1 share for one apartment in cooperative group housing society at Gurgaon. For which I have taken a home loan from IDBI bank in the year 2004 by depositing the original share certificate with the bank .I am availing tax benefits for the interest paid and principal amount . The same apartment is also rented out and i am showing the rent received in my income tax returns. (ii) No conveyance deed of the flat has been carried out by me till date. (iii) There is as scheme floated by central government under the aegis of CGEWHO for housing project at Noida in which there is one condition that central govenment employee must not have any flat/house etc in NCR. (iv) I have made PAN card of my HUF with name VIVEK JAIN (HUF) and with the help of this i have also opened a Bank Account for my HUF. (i) Whether the status of property will be changed if I blend my self acquired property to HUF? Whether the same is accepted in the eyes of law? whether blending will make me eligible for participating in the scheme. legally. (ii) Legal procedure to do the same. Your case seems to be little complicated, better ask it on our forum : http://www.jagoinvestor.com/forum/ or meet a good lawyer ! A HUF gets contribution from its members to buy a property and puts this property on rent. My question is, in whose hands this rental income will be assessed. In HUF’s hands because the property is in its name or in member’s name, because indirectly it is the money of the members which is fetching the rent? Then what about clubing provision?? I think Rent will clubbed to the income of contributor. My father had taken an insurance policy, where the policy holder is the HUF? Does this means that the lives of all the members of the HUF are insured by this policy? Definately NO , HUF is just paying the premium , the primany insured person would be karta of the family or someone else specifically mentioned. So only that person life will be insured. In the current Union Budget 2012, they have mentioned that if HUF would receive any sums from the members, it would not be taxable in the hands of HUF. For details have a read at http://insight.banyanfa.com/?p=546. What would be your view point ? I havent see it in detail , but I will assume that this rule is there as you have already studied it , its good that something like this has come. but now are you sure that the CLUBBING Provisions are not there and also in this case , its easy to give something to HUF , but once that is done , that thing becomes HUF property and hence property of all the members, like say you and your brother are part of your father HUF , suppose you have 1,00,000 and that is 100% yours, now you can give that to HUF, but suppose after that the HUF is broken , your brother will the part of it . So how is this new rule going to help ? Is it possible to take business loan on HUF? I have received my share of money by selling ancestral property which was inherited to us.. I have opened an HUF account and deposited all money there .. I am planning to start a business with that amount but will be requiring working capital loan to run that business.. So do u have any idea as to bank financing HUF? And also will that money be taxable as first i received in my personal account and then transfered it to HUF?? I personally do not have that level of HUF understanding, better catch a CA on this . manish ji, you have not replied to my query as to can it be possible that a PPF a/c be opened in the name of karta/member/minor member of HUF and HUF contribute amount in that PPF from its bank account and HUF claim deduction u/s 80 C.
HUF can be opened only in the name of the karta as he is head of the family and the money deposited has to be from the HUF income only . Amazing sir. You continue to amaze me by your enlightening articles everyday! Very informative..!! thanx 4 sharing such a valuable advice. but Manish Ji I want to ask that can I gift some hard cash to HUF account & then get tax exemption for the same amount from my income. Can I fund HUF Account with rental income from my individual property? Property is on my name/individual PAN and want to put rental income on this property to HUF Account so that I can file it separately during ITR. Can a member of HUF gift/transfer the his/her individual money to HUF account? I Guess he can do that , but why ! This can lead to evasion of tax. Thus this is not allowed. If done, interest on such amount is taxable in the hands of member. Can HUF make tax savings by investing in PPF account? But I have read somewhere that HUF cannot open PPF a/c (as per amendment made in May, 2005) and that the deduction will not be claimed by it. manish ji, can it be possible that a PPF a/c be opened in the name of karta/member/minor member of HUF and HUF contribute amount in that PPF from its bank account and claim deduction u/s 80 C.
Can one open a current account in the name of HUF. If yes, then can I pay my LIC policies which I had been paying from my personal account through my HUF Current Account since I am the “Karta”. Also, are there any restrictions in using that current account ??? I became the karta in my fathers HUF after his death. can I open a new HUF in my name and also be the karta in my new HUF ? Let me know who are the other members of the HUF. If your brother and sisters of HUF then you can start new HUF with your wife & children. Yes , even if you are part of a father HUF , you can still open a new HUF when you are married ! Can a HUF PAN be obtained even after years of marraige have passed? If yes, then what will be the Date of formation? My wife and I are working and both are paying tax. I also do a part time job for which I get form 16-A with deduction of tds at 10%. 1) Can I start a HUF and ask my part time employer to make the cheque in the name of HUF. 2) Few years down the line, when we want to purchase a house, can we break the HUF and use the money accumulated in the HUF for purchase. (Is a partition of HUF between Husband & Wife allowed ?). Would like to know if one can take loan for home loan principal prepayment and pay it back to HUF with interest. If so, can he show the interest as deductible from taxable income similar to a bank loan. Srinivas , yes that can be done .. Yes, Srinivas… it is legally possible to do so but practically very difficult and not advisable…..
taking a loan is possible but showing the computation of interest is not easy as many Indians tend to avoid paying taxes by doing this.. I was told any amount more than Rs. 50,000/- it is taxable . Yea .. but I am not sure if that limit applies between father in law and son in law, still confirm it on forum ,you will get the answer for sure ! but father-in-law is not a reletive to HUF ?? Imagine a women who is married. She will be part of HUF of husband and her father both ! i wanted to know if my father in law gift my HUF Rs. 1,00,000/- is it taxable? If my HUF were to receive a gift of Rs. 1,00,000/- from my father in law. My father had created an HUF with me. When he expired, PNB did not agree to accept me as Karta. They made my mother (very old) as Karta and I became the manager to handle the affairs. (refer to Your comments on 6th Oct). Please advise as to how to close old HUF, since I have also created an HUF with my family and also can I transfer all or some money from Fathers HUF being manager. Although I’m a Christian I’m not eligible to have an HUF account. But since a lot of Christians too have got Hindu names (like Sachin, Pravin ect), can I open an account with a name like “Sachin HUF”? A HUF cannot open a new PPF a/c now . This rule was passed a couple of years back. The running HUF PPF a/cs will not be renewed further.This is big disadvantage for HUF now! I am under 30% tax slab. i generally invest in shares and have some interest income. this income is added to my salary income and is taxed at 30%. my wife is a housewife and have very less income from shares. she doesn’t have much capital in her file. i would like to give some money from my file to my wife and she can go for FD. can you please let me know if i can simply give 4-5 lac Rs to my wife or is there any restriction? if not, what are the options to make her income tax file big. To me it is looking like a CHAKRAVYUV… easy to get in … difficult to get out. Many thanks to jagoinvestor for this article. As suggested by someone, a few hypothetical cases can be created, elaborated and discussed. I really enjoyed the article. I fully agree with the author. Looking forward to more such articles! You made it clear that only Hindus/Sikhs/Jains benefit from this provision – it seems unfair? Or is there some other rule that gives similar tax benefits to Christians? There is nothing like fair or unfair . HUF is defined in Hindu Act adn not Income tax act . By definition, HUF is for joint family property. However, Karta can utilise it as general tax saving instrument. It is not necessary that the existence of HUF need be known to all the family members. I think HUF can be created by Karta and the fund flow in and out can be managed by him. These details are not known to the family members and mostly they may not care. Hence if HUF is strengthened with cash and not with immovable inheritances, the issue/(fear????) of coparcenors (knowing and) calling for a split can be minimised. True that one has to pass on the financial inputs to the family to make them financially educated. However one can have cards up in his sleeve, right? 1. It is mentioned that wife of Karta can not be Coparcener. So, if I am Karta and I die, what are rights of my wife on HUF assets just as a member? 2. What difference it makes if one is Coparcener or a member, in terms of claims on HUF assets and income? 3. Can my son / daughter as Coparcener can withdraw assets / money from HUF at thier whims & fancies or Karta is the only one deciding authority. It will be very useful if you clarify above points. 2. A coparancer has the right for asking for share in HUF , member cant ask for share .. Thanks for response. Since my wife can not become Karta on my death with adult children and adult children can take out HUF assets any which way they like, this entire concept of HUF looks to me quite a problematic one. It may be useful in some instances. However, a person needs to be very careful in creating HUF. Consequences go beyond just tax savings. Thank you very much to you guys for educating me on HUF. I was not aware of these details. Good article as usual. And long awaited one. Concept of HUF explained in lucid fashion. Beautiful illustration(photo) which is a regular feature. I created a HUF a year back. In some banks, they donot open an account without a PAN card though it is not a legal requirement(My experience in SBI/ICICI). So one can apply for a PAN for the HUF first and then go for a HUF account. One general principle is one can manage tax efficiently if he has more than one PAN cards. However, to make it legal, one can take the help of HUF, Major children and older parents(if their income is lower than tax limits). I tell that an adult child can be an earning member of a family eventhough he/she doesnot have a job, rather the age of 18-23 of a child can be utilised for taxplanning of the parent. HUF can also be used for an efficient way of tax saving for the future. A family can get gifts and strengthen their HUF. As indicated, HUF can pay many expenses like insurance etc. For me this can be apart of overall financial planning for a married couple. Let me explain. Soon after marriage a couple can create a HUF. They can strengthen the same by routing gifts to the family to HUF. Once the taxable limit is reached, it can go for savings like PPF/insurance etc. Once that limit is crossed, one can go for demat account for HUF and invest in various instruments. Meanwhile they will have a child(most likely, of course). Once he/she attains age 18, part of the money can be gifted so that his/her tax limit is fulfilled. Will give some leeway in the HUF to strengthen it further. Same can be done for the second child!!!!!!!. Once the child is married, he/she can form a new HUF and the whole process can be repeated. Over and above, the existing HUF can gift to newly formed HUF. This cycle can go on endlessly. What is the catch. It requires that the family remains united. If a coparcener seperates for any reason and wants his share, issue arises. Good and logical points from you . What are the documents required for applying a PAN card for HUF ? Same as that for normal PAN. Address proof and identity proof. Can be applied online and takes about a month. So banks dont ask for members info or how many people are their in family ? they just issue the PAN ? Actually this detail(about coparceners) is required by the bank. However, in ICICI bank where i finally opened a HUF account, they were satisfied with my details and HUF PAN card(Of course, i am an account holder already, which did help). Not sure what other banks do. Actually there are many practices by respective banks which are not required legally. Many customers, to prevent a showdown (or due to lack of knowledge) accept and toe the line of the bank. Nice and informative article. I have a question regarding the reverse HUFication. What I want to ask is that what is the procedure of transferring the properties back to individual member’s name and what are its implications? My only confusion is which wife to choose ?? — Just kidding. What if I am not a Hindu? Thanks for the nice article Manish. Generally what I understand is if you have an ancestral house then only HUF will save you some tax. Would there be any benefit for a couple who have considerable savings and income on their only. If there is a chance I can contact a CA for further details. Yes Giridhar, you are right – it is mainly beneficial to those having ancestral property. Good Article Manish. You could have touched upon a few more points though. Or perhaps you can do so in a follow up article. Maybe with a few more examples with computations. 1. What about property jointly held by husband and wife? Say a flat that was purchased by them jointly. Can such be transferred to the HUF? What would be the implications if such is possible? Can EMI payments be shown as coming from the HUF? What about property registration? What about purchase of a new property? 2. Income of the HUF – if the HUF by itself has no income, can the Karta and other members contribute a portion of their income to the HUF and show that as HUF income? As a gift perhaps? Or an interest free loan to the HUF? Implications if such is possible? 3. HUF investments – can the HUF invest in say mutual fund and stocks? I assume yes since it is an independent entity with it’s own taxation. Tax implications? 4. What happens when the current Karta dies? Let us say the husband is the karta and he expires. What is the process by which either the surviving wife or eldest child (perhaps) is made the new karta. It would be great if you could combine these are additional points raised by other readers and create 2 – 3 hypothetical case studies and elaborate on them, with detailed computations etc. That would help us understand this concept much better and empower us to better discuss with a CA. 1. No , you cant assign some property which was bought by husband and wife .. it has to be FAMILY PROPERTY Which was inherited ..
2. No you cant contribute income to HUF ..
Too good of an article. I use to show paying rent to my mother. So that will give less tax liability if my mother gets a HUF PAN card. Meet a CA first .. dont create HUF without CA suggestions . “A”, who has 2 daughters and a son.He long back ago purchased a house in the name of HUF and put that house on rent, so that the Rental income comes to HUF and will not be be added in his or his spouses’s income . But now , he ‘s retired and wants that this property should be transferred to his son after his demise. But this is not possible as that property belongs to HUF. He can’t even write a WILL for HUF property and with the huge rise in Real estate prices, none of daughter is ready to leave her share in it. The daughters would continue to be members of their father’s HUF after they get married. Of course the question of cordial relations between the existing and new family arises and must be dealt with. However technically the daughters can continue to enjoy the benefits of their father’s HUF. Or am I making a fundamental mistake here? Gautam, you are very much correct ..that even after marriage daughters will remain part of father’s HUF. But the issue is how would a father give away the property which is a part of HUF to his Son only. All have equal rights on it. The time when he formed this HUF and transferred the property, he was not aware of this sort of practical pproblem. Yes, this is one problem associated with HUF as now the Assets belong to the whole family and not to a specific individual. Can the advantage of HUF be also taken if you form a company instead of HUF. Probably in a company, there would not be ineritance issue as every one would have some definite share in the cpompany which could be bought out or transfered/ willed. The main benefit of forming a HUF is to avail the benefit of lower slab rates which wont be available as Companies are taxes at a flat rate of 30%. The benefit of slab rates is not available to a company. Moreover, the cost of forming a company is very high and a whole lot of compliance issues arise in a company. After amendment (through Budget 2012) in gift provision to/from HUF, I think HUF can gift that house to member of HUF (being relative), thus it is not a problem any more! good too know, but hard to implement..:). will give a try. one question can you open demat account or MF folio by the name of HUF? Yes, Demat Account can be opened in the name of HUF and the name of the Karta would also appear in the Account Name. opened in the name of Existing Karta but not in the name of Deceased Karta and HUF entity. The demat account shall be in the name of natural persons, PAN card details of the HUF would be captured in the system. Therefore, demat account cannot be opened in the name of HUF. Excellent information. You always gives the best info for all of us. Nice article and I am sure 95% of the people who pays tax may not know these secrets. thanks 🙂 . A lot of people just hear about HUF but never try to learn how it can be useful for them ! yes, it is really informative . of course am not opening as not required as per the criteria you stated. Good .. please consult a CA before that ! However wanted to check with you. Can i loan some amount to my spouse and she invests the same (and includes the income in her tax return and pays taxes on it)and she pays me nominal interest say 3.5% p.a. I pay taxes on the nominal interest part. Will this attract clubbing provisions / shall i be liable for any taxes ? There are many complications involved if you are giving this as a Loan. It would be better that rather than giving it to her as a Loan, gift this amount to her. And in case you want the money back, tell her to gift it back to you. (4) If I need 5 lac back, She gifts me back ? Are you suggesting that it would work, and We (I & my wife) ended up paying no tax on interest/return on investment ? If yes, Then how do we gift money? Some documentation has to be done? Please share it with more people !